Vintage Spirit is the magazine for those who enjoy the spectacle of immaculately restored old machinery, or are fascinated by Britain’s rich transport and industrial heritage. Each month we bring back the sights and sounds of yesteryear in vivid detail with all the latest news and events from the preservation world as well as fascinating features on restoration projects, manufacturers, museums and well-known faces. Written by enthusiasts for enthusiasts, Vintage Spirit is a celebration of not only what used to be, but also what still is. With thousands of readers from the preservation world, including many engine and vehicle owners, don’t miss out on your chance to put your business, event or attraction in front of this dedicated and enthusiastic market. Contact us for more information on display advertising, classified and more. 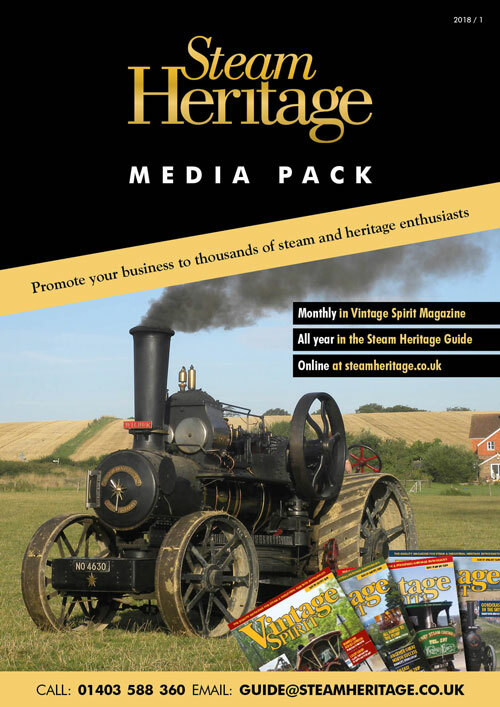 For over 50 years the Steam Heritage Guide has been THE resource for the entire UK preservation scene covering all aspects of our heritage. With around 950 museums, heritage railways and attractions and 1,500 events and steam rallies listed, it is Britain’s most comprehensive guide to the heritage market. A5 in size, the Guide is published annually in March and is used by enthusiasts throughout the whole year. See below for advertising costs in the Guide or contact us for deals across all our publications.